I’m working on a post for Download Squad on how to synchronize a Windows Mobile device with Thunderbird. It should go up on Sunday. This is probably my favorite Mobile Minute yet, because I had a vague idea of how to perform this task before I started, but I’d never really bothered to do it. Since Windows Mobile is really only meant to work with Microsoft software, you have to jump through some hoops to get it to synchronize calender, contact, task, and email information with anything other than Outlook. Of course, that means I’m stuck with Outlook 2002, the version that came with my PDA, because I don’t feel like shelling out the money to buy Office 2007. If I want a more up to date calendar/email/task program, my best bet is Thunderbird with the Lightning extension. And ActiveSync does not recognize Thunderbird. 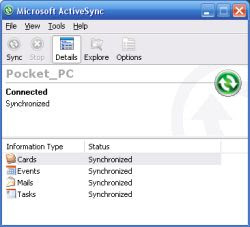 There are third party synchronization solutions for Linux and Mac users. But there are surprisingly few solutions for Windows. My review looks at the two solutions I was able to find, neither of which was perfect. Ultimately I think the solution that might make the most sense for now is to synchronize Outlook with Thunderbird. That way I could sync my PDA with Outlook, but without ever opening Outlook, I’d be able to access all of my data in Thunderbird. Now, if only I could find a program that would actually do that. Any suggestions? Were you were able to find a viable solution? Whoops. I found a few, but didn’t love any of them. I’ve updated the post.